Rainwater is collected from the roof drainage system by the underground Wisy WFF vortex filter (1). This filters out the debris from the water and diverts about 90% of it into the storage tank. The remaining water goes to soak-away or storm drain in the usual manner, as does the excess water from the tank. As water enters the tank it passes through a calmed inlet (2) which calms the flow of water and prevents disturbance of any sediments. Water is extracted by the pump (3) through a floating suction filter (4) and supplied under pressure to the garden tap (5). The pump is fitted with a flow controller which automatically turns the pump on/off when the garden tap or other outlet is opened/closed. Pressure hose (7) is ducted to the house through a drainage pipe (8) to allow for easy removal and replacement. An overflow trap (9) provides a water seal against any foul odours from drains. N.B. - an anti-backflow version is available if the connection is to foul again. The pump has an in-built flow controller, which starts/stops the pump when a tap is opened/closed. Dry-running protection for the pump is provided by a built-in cut-out. To reset the pump power must be turned off and then back on again. The pump is shown supplying a dedicated tap; we recommend an additional tap from the mains supply provided. The rainwater tap should be clearly identified. If the pump is required to supply at low flow rates (e.g. 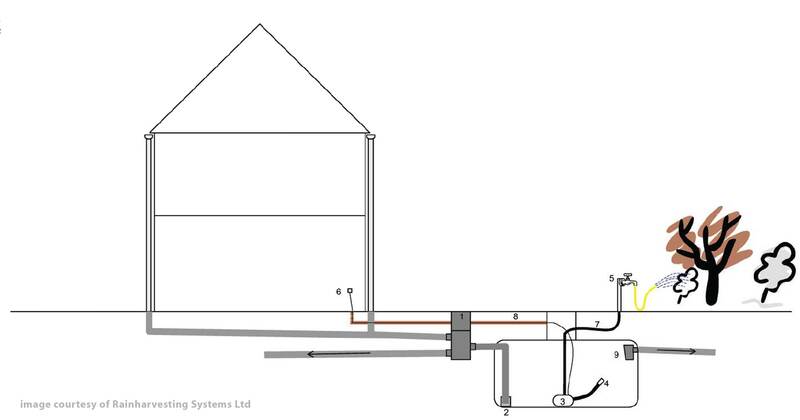 dripper system or mist unit) we recommend the addition of a pressure vessel.